The first time I asked out a girl, the hardest part was just going for it and starting to talk. So I tricked myself; I planned out my first line and made myself start it. Once it was out there, there was no turning back, and I had to stumble my way through it. The same tactic works for blog posts. 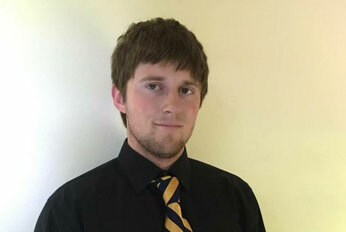 I’m Brandon Hoege, the latest Marketing Communication’s intern at IH Concepts. This is my first attempt at putting my thoughts into blog form, but I’ve been writing short stories, poetry, and music since I was 14. That’s about the time I started dabbling in guitar and singing too, so things just seemed to fall into place for me creatively. I knew a highly structured 9 to 5 job wasn’t in my future, so I pursued a degree in mass communication and a minor in creative writing at the University of Wisconsin-Eau Claire. I’ll hold that degree in my hands this December. I grew up in the small Wisconsin town of Sauk City, or as I need to say to most people, about 30 minutes from the Dells. While the other kids were out excelling at sports, I spent my time being sub-par in both music and athletics. Songs have always served a big purpose in my life, and I rhythmically and lyrically appreciate every type (except pop country songs of course, that shouldn’t be a thing). I love the Foo Fighters, Mayday Parade, Matchbox Twenty, and Blink-182, who I’ll finally see perform at Summerfest this year. Teenage angst, rejoice! I currently play bass and sing in a three-piece rock band called The Tri-Hards– my main outlet for creativity. I’ve always been interested in the field of communication and advertising, so I truly appreciate the opportunity this internship gives me. As the Marketing Communications intern, my main task this summer will be writing blog posts and tips to help educate, and hopefully entertain, my readers. Stay tuned for my next blog coming up soon, which puts one pharmaceutical company that leads by example in the spotlight. Happy reading!